Last year after the Movember 10K in Greenwich Park I decided that it would be the end of my running year. After all, the weather was getting bad, surely I would not succumb to the desire to continue running into the season of snow, santa suits and antlers. WRONG! I ran the Richmond 10K and Kingston 10K (my first ever 10K where I did not stop). So of course this year, after running the Movember 10K in Greenwich Park I decided again that would signal the end of my running. After all, the weather is getting bad… HOLD ON! 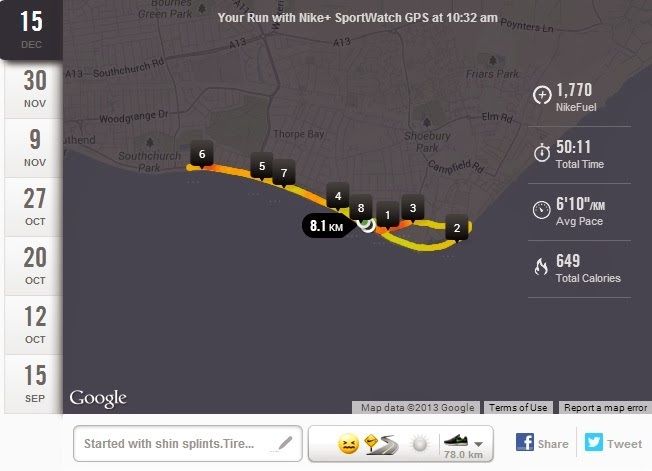 The race was in Shoeburyness and not Southend. This is the end of the line and an hour plus from London. I had terrible shin splints and cramps walking to the start from the train station. There was a good crowd though, a lot dressed up, a lot of Santas, a lot of reindeer and even a turkey. And by the end there were hats, beards and antlers in the gutters. The race was along the waterfront at Shoeburyness by beach huts, back along in a loop by the coastguard station and then along the waterfront again. I was not in a great state and I had to stop and retie my shoes twice due to pins and needles in my feet. The shin splints were killing me but I kept going, averaging the 10 minute mile at any distance that makes for a happy me. It was one of those small races where there were several different kinds of medal as the race organiser hadn’t been able, or didn’t care to, get everyone the same reward. I would have preferred either of the other two to this… Ah well. 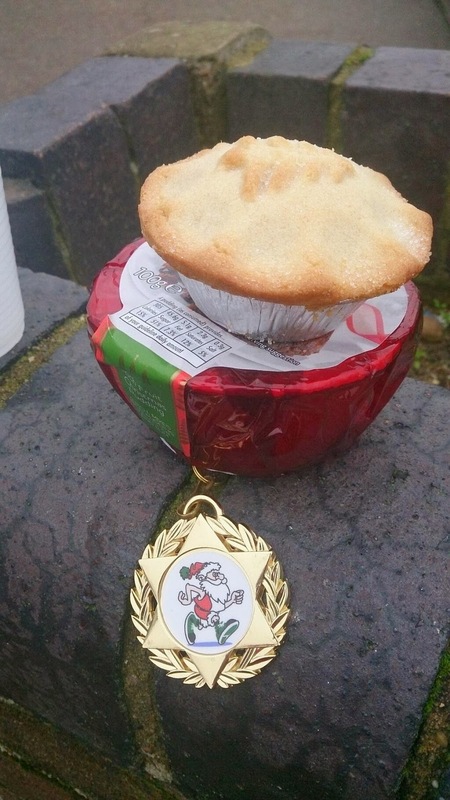 And then, to top that, @SausageSnaffler ran the Santa run 10K in Lincoln and got this monster. Oh the humanity! 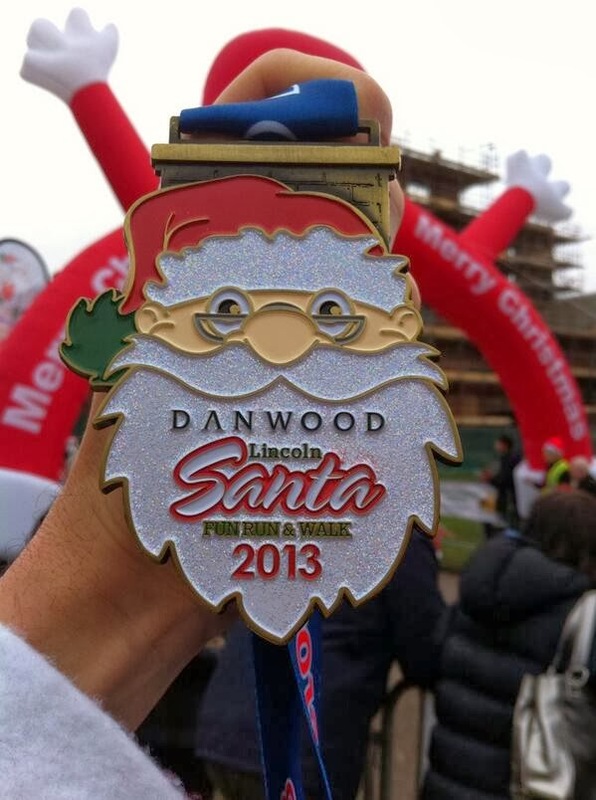 The Lincoln Santa 10K from the same day. MEDAL ENVY! On the plus side I did beat my MILE record. PB for me! Woohoo! So it wasn’t all a disaster. Which is what happened last year, when, after saying that was it for the year, I then beat my 10K record and I finished a 10K without walking for the first time. Next year I am in Lincoln.